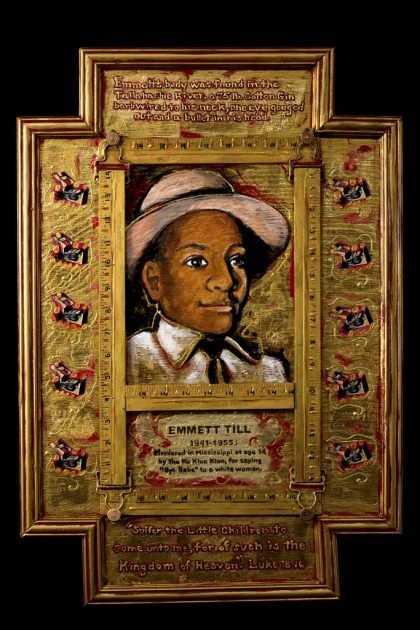 Emmett Till was 14 years old when his mother put him on a train in Chicago to visit relatives in Money, Mississippi in the summer of 1955. She was a well educated and devoted mother who had taught her son that a person’s worth did not depend on the color of their skin. Having been raised in a working class section of Chicago, Emmett was bold and self-assured. He didn’t understand the timid attitude of his Southern cousins toward whites. He even tried to impress them with a photo of himself with a white girl he claimed was his girl friend. Shortly after arriving in Money to stay with his uncle, he drew the picture from his wallet and showed it to some boys as they stood outside a local convenience store. The boys dared him to speak to a woman in the store. Emmett went in, bought some candy, paid Carolyn Bryant, the store owner’s wife. and then said “Bye babe” on his way out. Outraged that a black youth had been disrespectful of his wife, a few nights later Roy Bryant, a member of the Klan, went to the home of Mose Wright, a 64 year old farmer and grand-father of Emmett’s cousin. Accompanied by a brother, Bryant demanded that Wright awaken the boy. As the white men dragged Till off into the dark, they told the old man not to make any trouble or he wouldn’t live to see 65. Three days later, Emmett Till’s body was found in the Tallahatchie River with a bullet in his skull, one eye gouged out, his head crushed on one side and a 75 pound cotton gin wired to his neck. Emmett’s face was so unrecognizable that Mose Wright was only able to identify the body by a signet ring that remained on one of his fingers. The ring had belonged to Emmett’s father, Lout Till, who had died 10 years before. Emmett’s mother wanted her son’s body returned to Chicago and insisted that there be an open-casket funeral “for the whole world to see what they did to my boy”. All over the country, people were horrified by the pictures of the disfigured corpse. Meanwhile, the trial of Roy Bryant and his accomplices ended in a “not guilty” verdict.A month later, Look magazine printed an article in which the defendants admitted with pride to having kidnapped and murdered Emmett Till.